First impressions are vital within the working environment, forcing companies to employ any marketing strategy to make their businesses stand out from the crowd. Labeling is one of those marketing strategies that effectively inform customers of your brand, although making it stand out is another job on its own. This is why domed badges were created to help businesses market their brand to a customer in a way that will solicit their attention and get a message across simply yet effectively. Domed badges, also known as domed stickers, resin labels, gel or buddle badges are manufactured through the latest technology that coats a clear, flexible urethane which produces a 3-D appearance with a glossy finish to elevate the label to make it stand out. It also creates a texture which is appealing, durable and flexible. What are the benefits of using domed labels? Domed labels have the ability to withstand various deterioration factors such as high UV, chemical exposure and other sorts of environmental extremes. They are scratch and heat resistant, and the colour will never fade, making them long-lasting and consistently effective for indoor and outdoor usage. Most types of labeling are only suitable for a limited number of uses regarding the environment or industry. Domed labels can be used in any environment by any company, big or small, as an engaging and appealing way to distribute your brand. This durable type of labeling has become an important part of branding for all businesses across various industries to inform customers of their brand, products, and services. They can be used in any marketing strategy to ensure brand awareness and identification can be made consistently to boost the success of marketing efforts. Marketing is hard for a lot of companies, whose industries are saturated. This type of branding ensures that your business stands out from your competitors. Domed labels stand out and are appealing, making it easier to clearly get a message across. They can be manufactured in any shape and contain any form of information that is required, making it only a benefit to employing them into your business practices. It gives the customer a clear view of your logo or information, which can increase your customer base or even create jobs due to increased visibility within the industry. Therefore, leads to increased revenue. Flat labels are all over the market which your competitors, as well as yourself, utilize with logos, product, and service information using a variety of fonts and colours. This makes it unlikely to stand out through design aspects alone. Domed labels have a three-dimensional effect and tactile surface which is highly noticeable and is an instant advantage over your competitors. If you would like more information on domed labels, do not hesitate to get in Touch with us on +27(11) 782-3346 or email touch@global.co.za. At Electronic Touch Systems, we do four types of embossing: full – key, LED, ridge or Braille. Embossing is created by applying heat and pressure to the reverse surface of the overlay, resulting in the formation of the shape required. Full embossing are instances where the entire surface of a specified area or text is embossed in the shape requested by the client. When an LED is embedded in a membrane switch, it is adhered directly onto the bottom circuitry. Often the client prefers to have the area immediately above the LED to be embossed to enhance the aesthetic of the membrane switch, although this is not necessary. Braille embossing for vision impaired users is also available. Which type of embossing is right for your application depends on the item’s use and your preference. Applying embossed keys eliminates the need to insert metal domes into the membrane switch. It helps to show the user exactly where to activate a specific key, since keys often have a “sweet spot”. Embossing creates an indicator to the center of a given key. It also helps locate a key in a low-light environment, enhancing the efficiency and accuracy of key presses. This would not be as efficient if the keys were flat on the overlay. Embossed keys also eliminate missed attempts to press keys, increasing the productivity of the user. Embossed keys enhance the graphic overlay of the membrane switch by creating a three-dimensional look to it. This in turn creates a snap action as the keys are clearly noticeable. Looking for embossing or tactile embossed keys on your membrane switches? Then look no further. 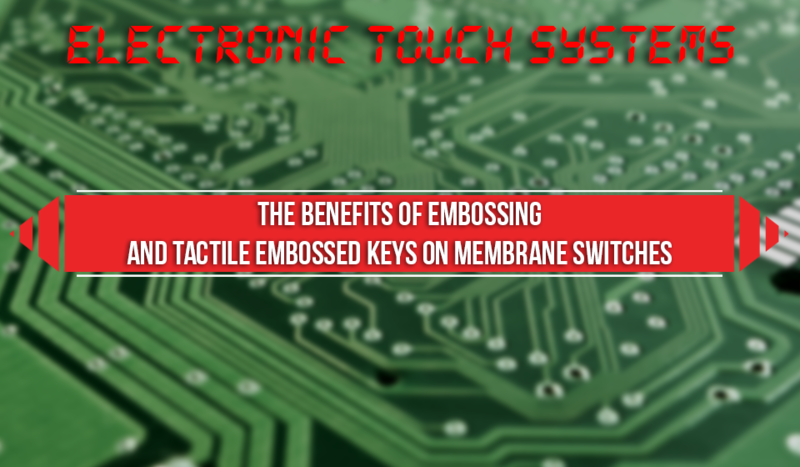 Let Electronic Touch Systems deliver quality embossing to suit your switches application. Call us on +27(11) 782-3346 for more information. At Electronic Touch Systems we can supply our clients with labels to suit their every need. Many clients though, upon approaching us to place their orders, seem unsure when faced with the manufacturing material options available. We produce vinyl and polycarbonate labels. On the surface, it might seem as if there is no great difference between these two substrate options. However, when one compares their price, application and durability, it would be well worth it to ensure that clients are advised on exactly which material option would be most suitable to their specific needs. In this article, we will take a closer look at our vinyl and polycarbonate labels, their advantages and disadvantages, which will hopefully make the choice a little easier. Vinyl labels are generally considered to be the most cost economical and cost-effective substrate when it comes to the production of plastic labeling products. These labels are highly elastic and considered suitable for both indoor and outdoor usage. Vinyl easily affixes to curved and irregular outlines and surfaces, making it the most suitable for general indoor applications and can stand up to light industrial usage as well. On the downside, vinyl has been found to tear much easier when compared to other plastic label options. In addition, it is also not quite as impervious to exposure to harsh chemicals which might lead to accelerated deterioration. In an effort to increase vinyl’s wear and tear clients have the option of selecting an overlaminate of a clear extra-protective layer to be applied when printing the labels, but this naturally increases production costs and might negate any savings achieved by selecting vinyl to start with. In our experience vinyl labels are best suited to company logos, warning and safety decals and product information labels. For the best all-around performance, our polycarbonate material option cannot be beaten. The most significant advantage that polycarbonate labels hold over other plastic labeling options is its light-weight and flexible nature combined with unassailable strength. Its polished appearance masks a hard-wearing exterior that is impervious to physical damage such as scratching and abrasions. Although polycarbonate is more often the first choice for indoor usage, there are however options available for use in outdoor situations as well. Polycarbonate labels will maintain their appearance and functionality for years without fading when exposed for long periods of times to UV light, while at the same time repelling the effects of moisture, physical damage and potentially harsh chemicals. Polycarbonate films are most often employed for control panels, membrane keypads and displays due to their resilience and attractive appearance. Polycarbonate labels are however more expensive when compared to vinyl options, but it’s eye-catching and long-wearing nature is generally considered worth the extra expense. Hopefully, this information can support potential clients in their decision making when it comes to picking their label material of choice. 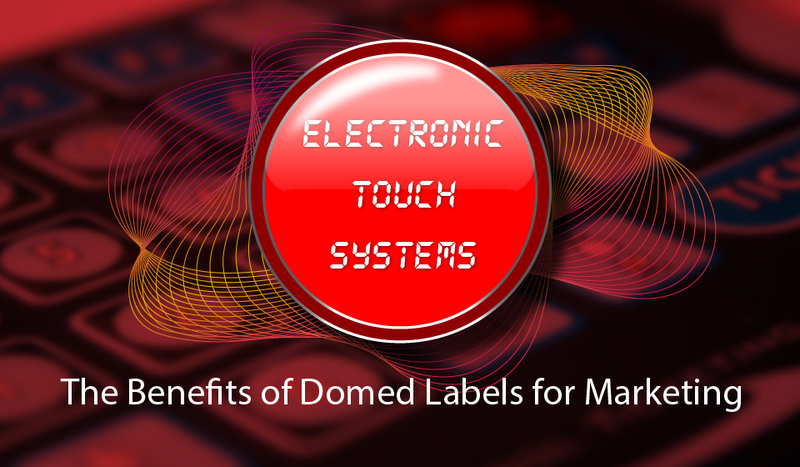 The Electronic Touch Systems team are however always on hand to apply their expertise in order to assist clients in making the perfect choice when it comes to their labeling material of choice. Please don’t hesitate to contact us to discuss your labeling requirements.